In a battle between former continental champions, Real Madrid downed Zalgiris Kaunas 92-86 in Group F in the Spanish capital on Friday. 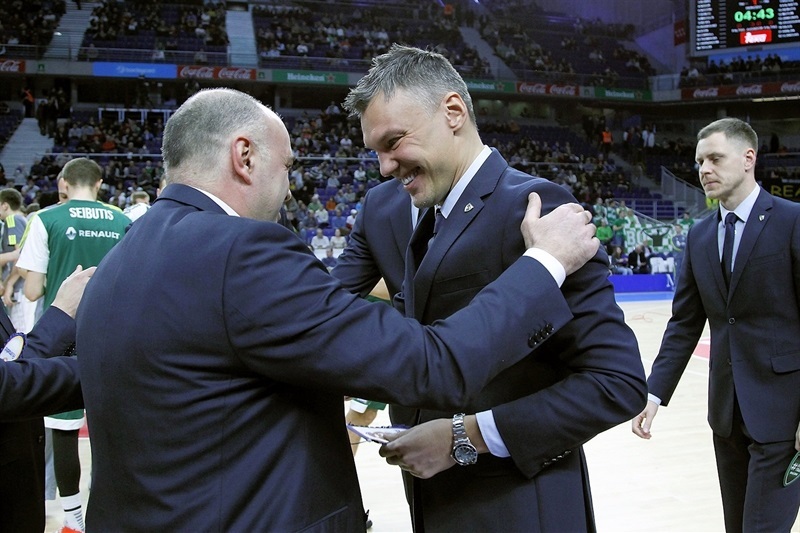 Madrid improved to 2-1 in Group F, while Zalgiris dropped to 0-3 in Euroleague legend Sarunas Jasikevicius's head coaching debut. Felipe Reyes led the winners with 24 points, a new career high in his 243-game career in the competition. Gustavo Ayon added 16 points, 15 rebounds and 3 blocks, K.C. Rivers scored 14 points and Jonas Maciulis 12 for Madrid. Renaldas Seibutis led Zalgiris with 13 points and Siim-Sander Vene, Brock Motum, Olivier Hanlan and Edgaras Ulanovas each added 10 points for the visitors. Ayon shined early to give Madrid a 26-18 lead after 10 minutes. The lead reached 13, but Motum and Seibutis pushed Zalgiris to within 45-42 at halftime. Madrid improved its defense after the break and found a go-to guy in Reyes, who helped the champs extend their margin to 65-53 after 30 minutes. 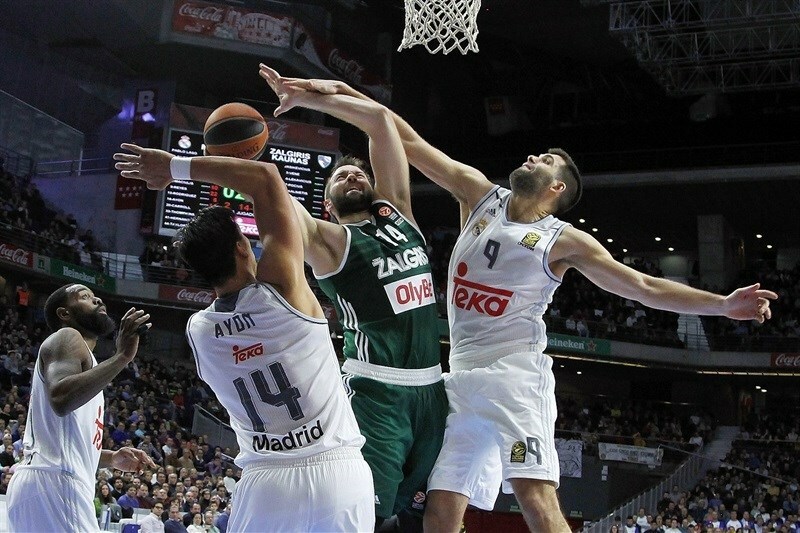 Zalgiris did not give up, but Madrid kept a safe margin throughout the fourth quarter. A minute of silence took place before the game to honour the late soccer legend Manuel Velazquez. 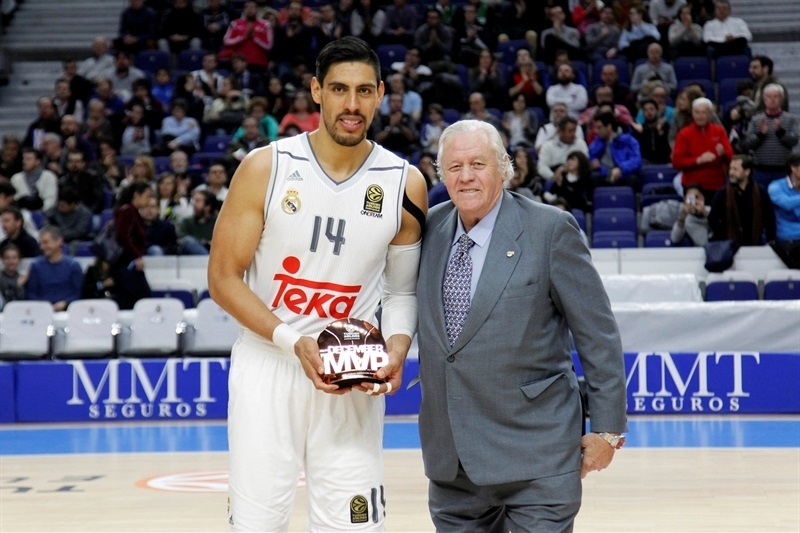 Ayon received his MVP for December trophy from Madrid basketball great Emiliano Rodriguez in a short pre-game ceremony. Ayon got Madrid going with a second-chance basket and Maciulis bettered Ulanovas's jumper with a bomb from downtown for a 5-2 lead. K.C. 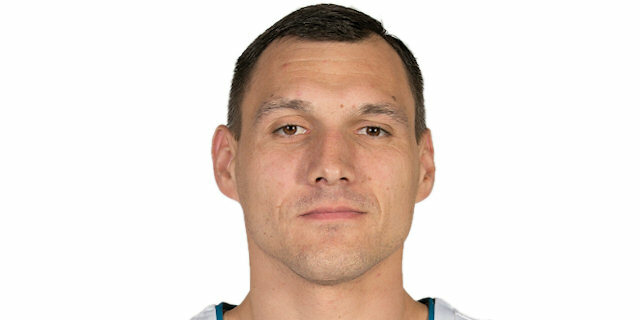 Rivers shined with a fast break layup and a three-pointer by Trey Thompkins prompted Coach Sarunas Jasikevicius call timeout at 10-2. Ulanovas kept pushing Zalgiris with a triple and a layup-plus-foul, but Ayon scored again for a 12-8 Madrid lead. Mantas Kalnietis followed a fast break layup with a one-handed floater, but consecutive baskets by Ayon restored a 16-12 Madrid margin. Ayon stayed unstoppable with a tip-in, Brock Motum and Rivers traded baskets and free throws by Reyes - finishing a four-chance Madrid offense - boosted the hosts' lead to 22-14. Jaycee Carroll hit foul shots to make it a double-digit game, 24-14. Hanlan took over with a reverse, but Ayon ignited the crowd with a dunk. Hanlan scored again in penetration to fix the score at 26-18 after 10 minutes. Ian Vougioukas buried a jump hook early in the quarter. 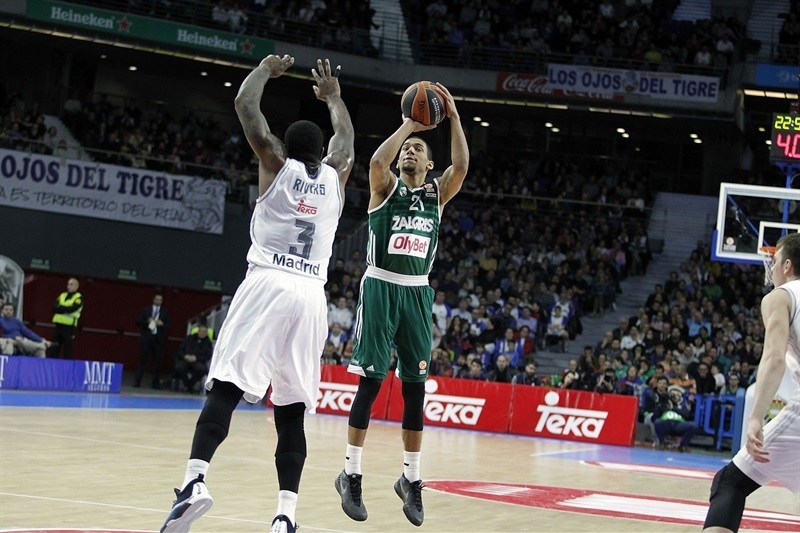 Reyes scored around the basket and a three-pointer by Jeffery Taylor boosted the hosts' lead to 31-20. Martynas Pocius nailed a turnaround jumper and Hanlan split free throws, but a layup by Mo Ndour kept Madrid way ahead, 33-23. Hanlan struck from downtown, but Reyes buried back-to-back shots from beyond the arc for a 39-26 Madrid margin. Motum scored around the basket and exchanged layups with Taylor. Reyes hit a jump hook, but Seibutis erased it with a driving basket and a layup by Motum caused Madrid to call timeout at 43-34. Ayon made free throws, but Seibutis took over with a reverse layup and Kalnietis added free throws to bring the visitors a bit closer. Vougioukas hit foul shots and so did Maciulis as Zalgiris came within 45-42 at halftime. Rivers shined with a fast break layup soon after the break, which Maciulis followed with a put-back basket for a 49-42 Madrid lead. Ulanovas hit his tradmeark jump hook in the low post, but Maciulis did even better with a layup-plus-foul. Seibutis showed great determination with an electric driving layup that Ayon erased with an off-balance tip-in, good for a 54-46 Madrid margin. Seibutis stayed on fire with a mid-range jumper, which Reyes erased with a closer jumper off the glass. Madrid improved its defense off a timeout, but a layup by Paulius Jankunas - his first points - kept Zalgiris as close as 56-50. 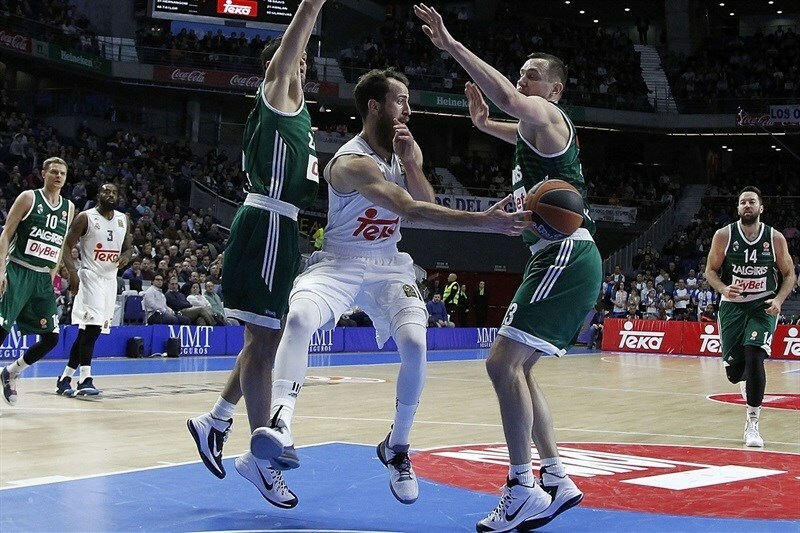 Rodriguez took over with a step-back three-pointer from the left corner and Maciulis added free throws to restore a double-digit Madrid lead, 61-50. Siim-Sander Vene sank a three-pointer, but Reyes quickly answered with a turnaround jumper. A buzzer-beating jumper by Andres Nocioni gave Los Blancos a 65-53 margin after 30 minutes. Rivers buried a three-pointer early in the quarter. Vougioukas scored again and free throws by Nocioni made it a 15-point game. Hanlan shined with a big basket in penetration, which Reyes bettered with an off-balance three-point play. 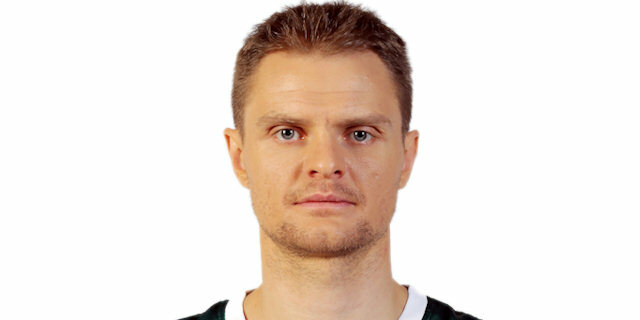 Pocius found space for an uncontested layup and a five-meter jumper by Vene gave Zalgiris hope at 73-61. A jumper by Jankunas caused Madrid to call timeout at 73-63. Nocioni stepped up with an alley-oop layup, but Vene did better with a bomb from downtown. Carroll answered from downtown and a dunk by Jankunas kept the guests within 78-68 with over four minutes left. Jankunas hit a jump hook and a three-point play by Seibutis brought his team within 78-73. Reyes and Vougioukas also got respective layup-plus-fouls and a three-pointer by Rivers led Zalgiris to call timeout at 84-76. Lekavicius answered from beyond the arc, but Ayon’s tip-in sealed the outcome. "I think we controlled the game at all times. Our problems were our mistakes; Zalgiris got a lot out of our mistakes. The last play of the game shows what happened during the game - we let them take an easy three at the end, with the game finished. 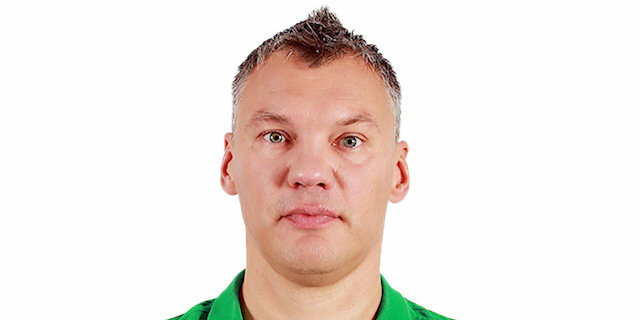 You also have to give credit to Zalgiris: new coach and they played with a lot spirit during all 40 minutes. We had good moments and had a 13-14 point lead, but they kept fighting and it was a hard game. As we know, this is the Top 16 and every game is difficult. It is a very tough group. We knew that every game will be a war and we faced a team that played with a different spirit. We showed that during the game, even during moments in which we dominated. We did a lot of things well, but they loved our small mistakes and kept fighting until the end. It may seem that a 6-point win is a narrow win, but we were the fair winners. I am happy because I know how hard it is to win in the Top 16." "First of all, congratulations to Real Madrid for its win. We didn't start the way we wanted. We gave Madrid a little advantage at the beginning of the game and it was difficult to come back. We managed to play quite well and then in the third quarter, we had a slow start, allowing them to rebound a lot, especially under our own basket. That was the key and what we want to change from now on. We came to play against a big team on the road, so we had to fight to overcome. And we fought. 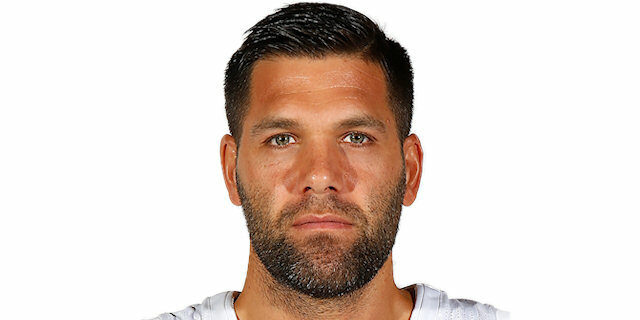 At some point in the game, we were doing quite well, playing more solid, more as a team, moving the ball more... and especially, I want my team to be tougher. These offensive rebounds showed that sometimes we are not tough enough. Real Madrid has tremendous talent, but 18 offensive rebounds allowed is too much." "This is a special game for me because this is my hometown team and these are always hard and emotional games for me. I am glad that we won: It was a really good fight today. After they changed their coach, we saw a totally different team and totally different style. I am happy that we won. We have to keep moving." "There are no easy opponents in this group. I believe we played really well in the first 15 minutes and relaxed a bit after that. Then in the second half, when you allow your opponent to get back in the game, they feel confident and everything is more difficult. We are happy with the win. It is very important for us to win all of our home games. We are playing well and have to keep going like that, winning our next three home games no matter what. Ayon and I already worked really well together last season. We feel really comfortable together on court. We have to make the most out of that, playing as a team." "Congratulations to Madrid for its win. We had a game plan that we could not execute the way we wanted. We allowed a lot of points early in the game. Our focus was to have a good start, but it just didn't happen. They scored a lot early and it was hard to come back. We played with good attitude and that is very important, thinking that we could win the game or at least challenge for it. We fought hard and are looking forward to the next game."